6 Center for Health Technology and Services Research (CINTESIS), Portugal DOI : 10.24953/turkjped.2017.02.012 Pinto A, MacDonald A, Cleto E, Almeida MF, Ramos PC, Rocha JC. 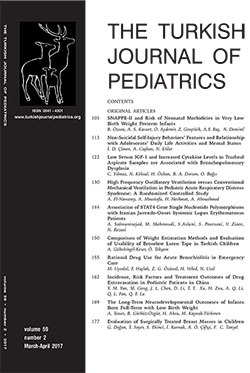 A case report of a 4-year-old child with glucose-6-phosphate dehydrogenase deficiency: An evidence based approach to nutritional management. Turk J Pediatr 2017; 59: 189-192. The objective was to describe the nutritional management of a 4-year-old child with glucose-6-phosphate dehydrogenase (G6PD) deficiency. A 4-year-old male child, African descent, born from non-consanguineous parents presented with a clinical history of frequent respiratory infections, usually treated with antibiotics. At 30 months of age, G6PD diagnosis was made after eating one portion (40 – 60 g) of fava beans, resulting in severe hemolytic anemia hospitalization for 5 days. Diagnosis was confirmed by G6PD activity measurement. Nutritional counseling was given to avoid dietary oxidative stressors particularly the exclusion of fava beans and accidental ingestion of other similar beans. Dietary intake of high vitamin C containing foods was discouraged and adequate hydration advised.